Frieda Mae (Slagle) Hazlett, 92, of South Charleston, Ohio passed away January 21, 2019. She was a lifelong member of the South Charleston United Methodist Church, a member of Rebekah Circle for many years, and a member of the Clark County, Ohio Farm Bureau. Frieda was a member of a group fondly known as the South Charleston Bridge Club, a collection of women that played cards once a month for many years. She looked forward to their time together as they rotated from home to home. Her family and friends benefited from the skills she displayed in the many afghans and quilts she expertly crafted. Frieda enjoyed helping others learn the craft and helped many with their projects as they experienced problems. She enjoyed doing the daily crossword puzzle in the newspaper and shared a passion for working puzzles with family and friends. She would jokingly swear there were pieces missing but quietly celebrated once a puzzle was completed. Some took months to finish. Preceding her in death were many loved ones including her husband of 47 years, Russell V. Hazlett. She left behind her children: Paul Hazlett, South Charleston, Ohio; Sue Ann Chaney, Delaware, Ohio; Stuart (Christie) Hazlett, Alexandria VA; Glen Hazlett, Box Elder, South Dakota; Joyce (Hazlett) McPherson (deceased) Jim Hazlett, Lakeview, Ohio; Phillip Hazlett; Frieda Mae was the eldest of 9 children of Luther Orin Slagle (Chief) and Margaret Louise (Parker) Slagle. 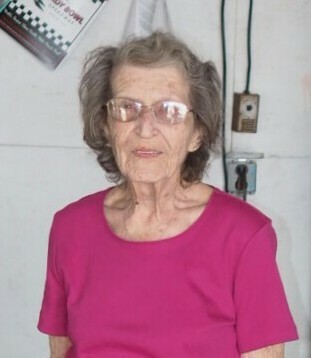 Her siblings include: Mary (Slagle) Dillion – deceased, Jo (Slagle) Young, Luther Orin Slagle Jr. – deceased, Barbara (Slagle) Ray, Nellie (Slagle) Ray, Ruth Slagle, Judith Slagle, and Carolyn (Slagle) Wilder. Also left behind are numerous grandchildren, great-grandchildren, and great-great grandchildren as well as cousins, nieces, nephews, and an entire community of friends and neighbors. Frieda requested there be no service of any kind. In lieu of flowers the family is asking you make a contribution to: The South Charleston United Methodist Church, 15 E. Jamestown St., P.O. Box G, South Charleston, Ohio 45368. Arrangements have been entrusted to the Richards, Raff & Dunbar Memorial Home. Expressions of sympathy may be made at www.richardsraffanddunbar.com.